Suppose you want to buy 2 Quantities of ‘Product-1’ With 2 Quantities of ‘Product-2’ and get 20% discount”. It is a simple case of combination of two products. Let us start with it. 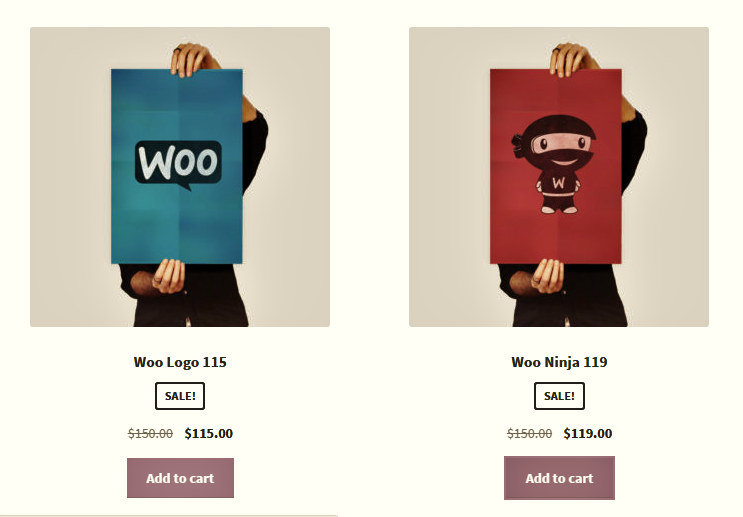 Navigate to WooCommerce>Dynamic Pricing>Combinational Rules. Now add the first product with it’s quantity. For adding second product, click on add rule. Once both products have been added, we will move to fill out the offer name, discount type and so on to define our rules. Offer Name:- Name of the offer (ex: Buy 2 Quantity of ‘Product-1’ With 2 Quantity of ‘Product-2’ and get 20% discount). It could be any name you want to give for better understanding. Discount Type :- Select the type of discount you want on your product. Percent Discount:- A flat discount percentage (eg:- 10). Flat Discount:- A flat amount of money will be given as a discount(eg:- 5). Example:- We will select discount type as a percentage discount and value as 20. This will deduct 20% when the product is added to cart. Allowed Roles:- It defines who all are allowed to avail this offer. 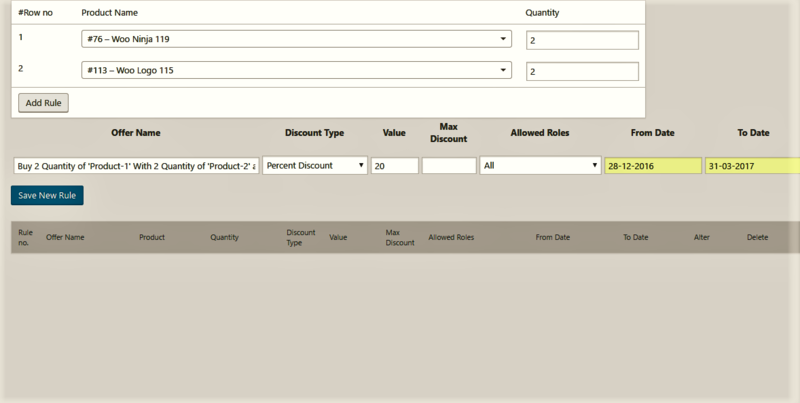 For this instance we can select “wholeseller” or “customer” user role. In this case, we have selected “All”. From Date-To Date:- It allows us to allocate a time frame during which the offer will be active. Click on save new rule and we are ready to go. Let’s move to the store and check the functionality of the rule that we just described. 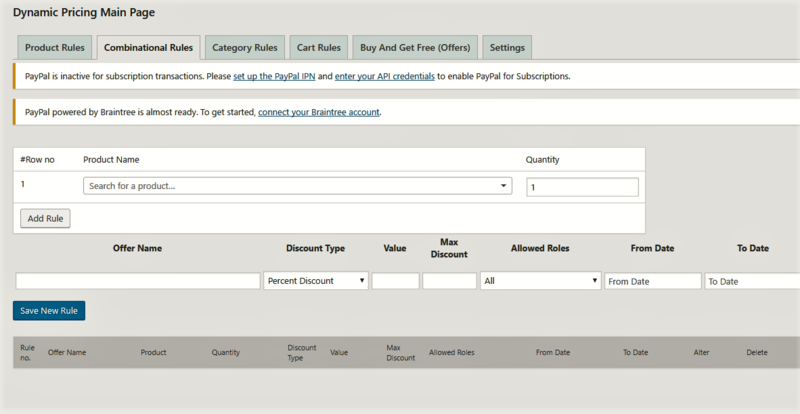 We will add the products(defined in the rules) to our cart. Let’s move to the cart and change the quantity to 2 as we have defined for the quantity of 2. 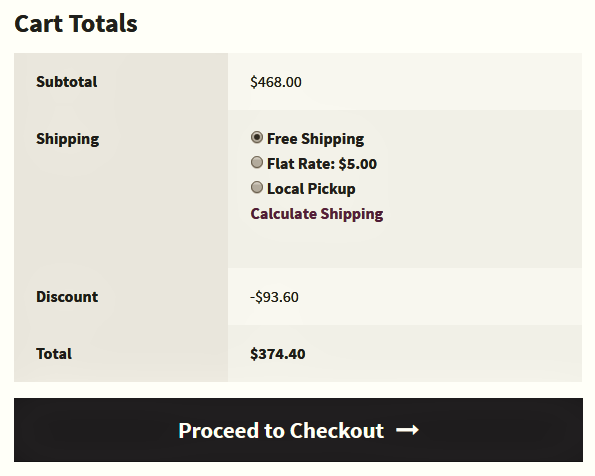 Then update the cart and check out the cart totals. Here we go! 20% discount has been applied to the store. It was quite easy. Isn’t it?